Debates And Debauchery: Drinking Games In 2012 Where there are political rallies, there are protesting groups. Where there are campaign speeches, there are fact checking teams. And where there are presidential candidates' debates, there are drinking games. 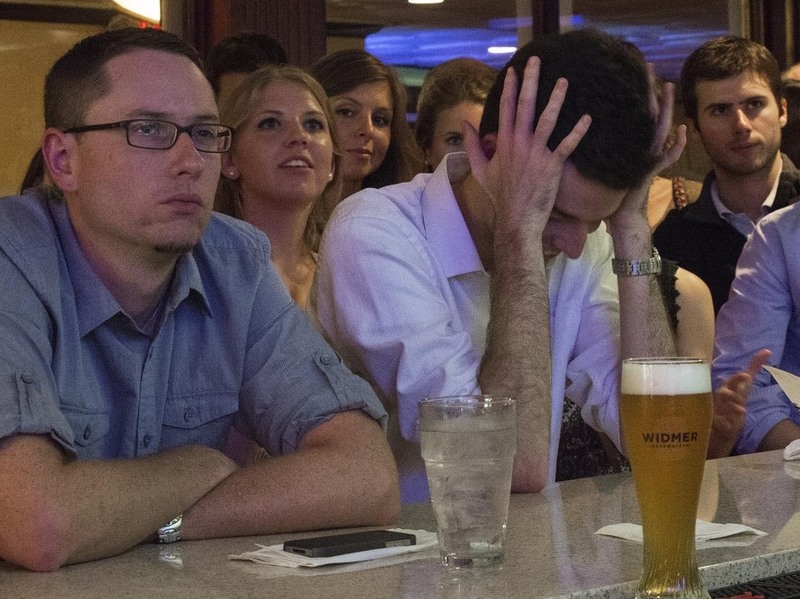 Bar patrons watch the Oct. 3 presidential debate at Bullfeathers, a bar a short distance from the U.S. Capitol. Drinking and debate-watching often go hand in hand — to the point where drinking games have been developed around watching the debates. Here's a new idea for a Presidential Debate Drinking Game: Every time someone says "Presidential Debate Drinking Game" today, take a drink. Just kidding. But drinking games have become a familiar part of the American political landscape — like buttons, bunting and bumper stickers. Where there are political rallies, there are protesting groups. Where there are campaign speeches, there are fact checking teams. And where there are presidential candidates' debates, there are drinking games. With the final 2012 presidential tete-a-tete, um, on tap tonight between President Obama and Mitt Romney in Boca Raton, Fla., some Americans are looking forward to the debauchery as well as the debate. You know how a debate drinking game works. It is usually played with a group of people who are watching the event. If a candidate utters a predetermined word or phrase, you take a drink — usually of the alcoholic variety. Some Internet habitués play the game with others online — putting the mead in social media. You can find contests tailored to the presidential debates all over the Web. The Cloture Club, a website of Washington goings-on, offers a list of two dozen utterances — such as "terrorism" and "United Nations" — and instructs players to drink each time either candidate speaks the word or phrase tonight. NerdWallet, an investment advisory company, breaks down the challenge by candidate. According to the game rules, "Take a sip when Obama: Mentions the dwindling middle class." Or "When Romney: Interrupts the moderator." Forward, a Jewish-oriented news site, created a drinking game especially for its readers. Debate watchers are instructed to "Take a sip if you hear: An anecdote about a Jewish lady in Florida/Ohio/Nevada or some other random swing state," among other things. And to "Pound a shot for: 'Choo-tzpah,' or any other butchered Yiddishism." "I suppose if I were in college I, too, might be listening to the diverging opinions on healthcare and homeland security in the same way," writes Caren Osten Gerszberg in The Huffington Post. "In other words: Drink when you hear 'Obamacare'; chug when you hear mention of Al Qaeda; sip continuously if a candidate goes over his allotted response time." She points to a College Humor drinking game that asks the question: "As two men face off in a rhetorical battle of epic proportions to determine the future of our great nation, why not booze it up?" Do inventors of drinking games believe that an increase in the intake of alcohol might make some candidates seem more attractive or more coherent? Dan Mueller, creator of Debate Drinking, says, "Our goal isn't to make the candidates any more interesting to listen to, but rather to encourage people to watch and listen to the debates, and to do so with their friends." Mueller, a Web designer in Dayton, Ohio, says, "We try to stay as nonpartisan and inclusive as possible." Therefore, Mueller's game avoids the " 'drink when the other side lies' type of rules," he says. "We know that people have friends and family with differing political views, and we believe that should not get in the way of sharing a beer and hearing both sides of the debates." Words on Mueller's list include: "nuclear" and "jobs" for Obama, and "freedom" and trade" for Romney. The official rules also offer this suggestion for tonight's encounter: "If either candidate greets moderator Bob Schieffer with "Hi Bob," EVERYBODY DRINKS!" As with everything else in America these days, there is a debate over Debate Drinking Games. "Drinking games generally have the goal of encouraging alcohol consumption to levels of intoxication and, commonly, much higher than the legal limit of intoxication," says James Garbutt, a psychiatry professor and director of the Alcohol and Substance Abuse Program at the University of North Carolina School of Medicine. Whereas a small amount of alcohol might bring on a pleasant feeling, Garbutt explains, too much alcohol can lead to a sad state "where judgment and social inhibitions can be impaired, which can lead to bad decisions and actions — think photos and videos that folks wished were never taken, on up to actions leading to legal problems or risk to health." As alcohol levels rise, Garbutt warns, "the physical effects increase with impairment in visual acuity, reflexes, motor function and balance — the reasons why we don't want intoxicated individuals driving. Acute high alcohol levels also increase risk for health consequences such as stomach pain and reflux, vomiting with risk of inhaling vomit and pneumonia, and injuries. " A drinking game, Garbutt adds, "may be 'fun' in the classic sense of alcohol acting as a social lubricant. But a game that encourages the development of intoxication — often to well above the legal limit of intoxication — has few pros. Needless to say, watching a presidential debate while intoxicated is not a good plan for informing oneself about issues that affect our lives." Sarah Lohman, on the other hand, thinks that presidential debate drinking games are harmless. Lohman is the creator of the historic gastronomy website Four Pounds Flour. "If you're playing a drinking game during the debates, that means you're watching it with friends," she says. "You're paying close attention, and you're probably going to talk about what they said afterwards. To me, there's nothing negative about that." Drinking games "are almost as ancient as drinking itself," Lohman tells a gathering in Brooklyn recently. (You can listen to Lohman's "Alcohol and Drinking Games" podcast here; she begins at the 34:00 mark.) She describes a drinking game played by ancient Greeks that involved flicking wine dregs from one cup into another. She speaks of another centuries-old pastime in China that is an alcohol-laced variation of Rock, Paper, Scissors. And she tells tales of "toasting games" that migrated from England to early America. By 1830, Lohman says, referring to a chart, the annual per capita consumption of distilled spirits in the United States was five gallons — for every man, woman and child. Such widespread imbibing led to a strong temperance movement and eventually Prohibition in the 1920s. America probably needed to dry out for a while, she tells the group. "We were a ... mess." Nowadays, Lohman says in an interview, "we drink faaaar less alcohol today than in the 1830s. Currently, we drink a little more than two gallons per capita per year." But by the looks of all the drinking games, some people drink a little extra — especially around election time.